Rental fees can be found here. Located in the Hurley Music Building on Woodlawn Avenue on the east side of the Centenary campus, the Auditorium features an expansive stage with a small green room. The fully functional lighting control system and enhanced acoustics are available for all your rehearsals, recitals, and performance needs. With an elegant vaulted ceiling and soft light filtering through the windows, the Anderson Choral Building Atrium is a charming choice for a small wedding, reception, or corporate event. The Atrium opens up into the Alberta Broyles Choral Lounge — an inviting space adorned with cozy chairs. The building also includes the Dr. Alberta E. Broyles Choral Room and a soundproof practice room. The Dr. Ed Leuck Academic Arboretum, located in the heart of campus, is home to more than 300 species of plant life. Shaded by 125-year-old trees, the Arboretum provides a stunning photography location for family portraits and engagement announcements. Year-round education programs along with hands-on science and outdoor exploration are offered as well. The collection is maintained by Dr. Leuck, Waters Chair of Biology, with student help from botany classes. It provides a distinct spot of beauty within campus, and serves as a unique teaching tool for Centenary classes as well as the Shreveport community. Built in 1955, Brown Chapel features soaring vaulted ceilings, an 81-foot aisle, and dark-stained wooden pews that can accommodate 500 downstairs and another 100 in the balcony. The pipes of the organ surround the choir loft behind the split-level raised altar. Booking Brown Chapel provides the bride and groom the use of the Chapel for both rehearsal and ceremony and separate bridal and groom dressing areas. Amenities such as microphones, a podium for readers, a column for a unity candle or marriage license, and the altar are also available at no additional charge. The Chapel can also be reserved for special events and church services. The Chapel is handicapped accessible on the west side. 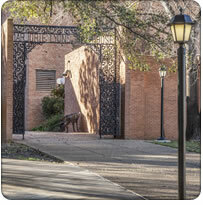 For info on weddings at Brown Chapel, click here. Bynum Memorial Commons features a large dining hall and several elegant meeting rooms. The dining hall itself provides buffet-style eating options and seating that can be reconfigured as you desire. The stately Hall of Fame Room, featuring a gallery of portraits of Centenary’s most notable alumni, seats 40 guests. The room itself is within close proximity to parking and provides a private, discreet setting for meetings. The Centenary Room, located in the back of Bynum Commons, is adjacent to the dining hall, making it perfect for those looking to have a working lunch. With the capacity to seat 50, the Centenary Room is equiped with a retractable screen that is directly linked to computer, projector, and sound system. The room also has a private entrance. Offset by a fireplace and panoramic windows, the Whited Room can accommodate 230 guests seated theater style and 160 guests seated at tables. The room has a retractable screen that is directly linked to computer, projector, and sound system. With wood paneling and a formal mantel, the Whited Room provides suitable elegance. Classrooms with various seating options and capacity are available for meetings and presentations. Lab space is also available. This picturesque area features beautifully landscaped gardens surrounding an enchanting fountain. Lovely year-round, the Gardens are particularly stunning when the azaleas bloom each spring. Paved walking paths connect to a stone-laid courtyard with a serene sitting area. The Centenary Fitness Center and Natatorium provides state-of-the-art exercise equipment, two racquetball courts, an aerobics room, a dance studio, an indoor running track, free-weights area, and a space for cardio and stack equipment. The Center’s 25-yard, six-lane pool offers a stunning view of the Arboretum and Peavy Gardens. The view is available as well to runners and joggers taking advantage of the raised running track on the second floor. Complete with a slip-resistant rubberized surface, the track travels almost an eighth of a mile around the inside of the building. A basketball court accommodates one college-regulation court game, and transforms to host volleyball or badminton games, or even accommodate large meetings or luncheons. The men and women’s locker rooms feature saunas, personal lockers, and showers. The original entrance to the gym now serves as the W.A. Haynes Memorial Conference Room. This charming garden, located in front of Centenary’s Student Union, features a bubbling fountain and brick paved courtyard. Placed amid the park benches stands Grace, a 16-foot stainless steel sculpture by John Raimondi. With renovations completed in 2011, the Gold Dome features a new hardwood floor, new sub-floor electronics and Ethernet, new seating, and a new public address system. The floor easily converts into courts for basketball, volleyball, or badminton. The facility transforms to accommodate large-scale meetings, trade shows, luncheons, or concerts with a capacity of 2,500. The athletic training room is equipped with a whirlpool, multiple training tables, exercise equipment, an ultra sound machine, and e-stim machines. The facility is staffed year-round by a full-time licensed and certified athletic trainer during normal operating hours. The Donnie Wilhite Media Room is commonly used as a meeting, film, or media room for sporting events held at the Gold Dome. The 32 capacity stadium-seated room is equipped with a film projector and sophisticated computer software for complete game scouting. Surrounded by Centenary’s quiet beauty, Hargrove Memorial Amphitheater features gently curved concrete built-in seating and a spacious stage. The frequent site of concerts and plays, the Amphitheater can seat 2,000 audience members. Located in the Smith Building and adjacent to convenient parking, the Kilpatrick Auditorium has the capacity to hold 175 guests seated theater style and 112 seated at tables. The Auditorium offers a double-entry stage with computer, projector, sound system, and a dramatic velvet curtain as a backdrop. A significant contributor to the Shreveport-Bossier arts community for over fifty years, the Marjorie Lyons Playhouse features state-of-the-art theater equipment (light, sound, and stage), a greenroom, dressing rooms, courtyard, and space for workshops. The Playhouse also features an expansive stage, 317 seats, and a box office. Positioned among the stately Georgian architecture of Centenary’s academic and administration buildings, the Quad’s well-manicured lawns provide the perfect setting for outdoor gatherings including picnics, weddings, and receptions. Adjoined to the Quad, Riggs Plaza features a shaded sitting area with comfortable park benches and brick pavers, just steps away from a tranquil fountain. These beautifully appointed rooms feature cable television outlets, telephone jacks, closet space, and room furniture (including an extra-long single/twin bed, chest of drawers, desk, and chair). Internet access is available both via wired Ethernet and wireless connection. Each suite of two rooms has a shared bathroom. 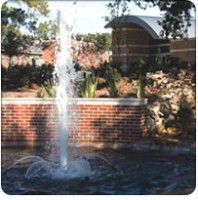 All residence halls at Centenary include laundry facilities, kitchen, and computer lab. Adjoined to the Quad, Riggs Plaza features a shaded sitting area with comfortable park benches and brick pavers. A few steps away from this tranquil area sits a bubbling fountain.